Play the classic Dominoes Online for Free. Install and play with noregistration! Find fun and competitiveness in this app: • 5 modesto play online with real players or smart/dumb robots • Excellentgame graphics and superior gameplay • Lounges for all kinds ofdominoes players • Join tournaments and win trophies • Compete inthe ranking • Track your stats of the matches • Training mode withrobots • Meet people from around the world and make friendsDownload now and start this great logic game! Find thousands ofpeople playing Dominoes online. Dominoes Online is a complete appfor amateurs and professionals Dominoes players! Install now andenjoy! 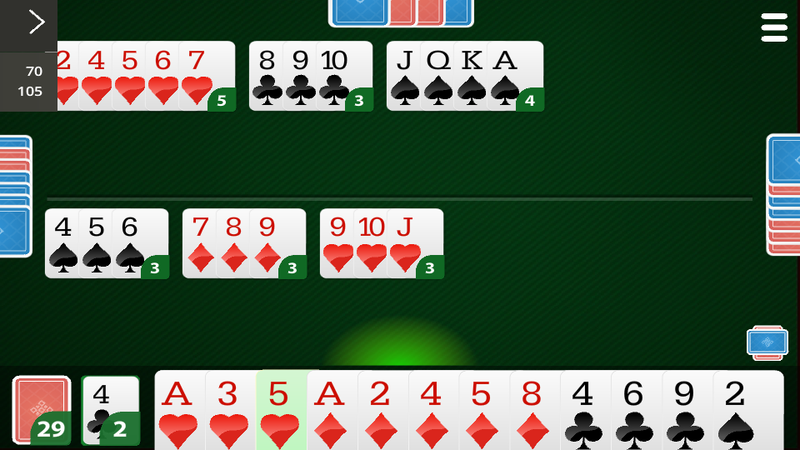 The most complete app with all types of Canasta, Burraco, BrazilianTranca and others Rummy games in one application. Play cards onlinefor free! No registration required to play Card games to playOnline and Offline: • Canasta Online e offline • Burraco • Burraco1x1 • Brazilian Tranca • Other 4 Rummy kind games Game Features: •Play cards with real players or against robots • Couples orindividual games • Excelent graphics and easy gameplay • Loungesfor all kind of Canasta and Burako players • Play and make friends- hundreds of real players all around the world Play Canasta andBurraco for free is a complete app for amateurs and professionalcard players! Download and install right now. Play Truco Mineiro between players online or against bots. Ourapplication connects to Server Multi Platform GameVelvet and youcan have fun with who's playing on the site, on the iPad, iPhone,iPod touch and Android. Play free online Truco between players online or against bots. Ourapplication connects to Truco Multi Platform GameVelvet and you canhave fun with who's playing on the site, on the iPad, iPhone, iPodtouch and Android. Live the experience and glamour of a great card player with RoyalBuraco - Card Game! Create your own table with whomever you like:challenge your friends and other Buraco players from all over theworld, or train with our robots, who are expert card players. Winlots of coins through your victories and be part of the world ofCanasta royalty. You are the best!Buraco is a classic card gamewith many variations around the world. It's really close to othergames like Canasta and Gin Rummy. In Royal Buraco - Card Game, youcan put your skills to the test in 3 different modes: BuracoAberto, Buraco Fechado and Buraco STBL. Play on a 2 or 4 playertable and prepare yourself for the challenge of multiplying yourcoins and melding many canastas!Other features:- Challenge yourfriends to a game and create a table with them! It is just likebeing in your living room at home, with everyone together!- Talk toother players using our chat.- Get coins at the end of each match,with an super prize for the winner!- Win daily bonus coins when youenter the game.- Customize the table and the cards in the deck.-Match statistics.- Multiple achievements for you to unlock!If youlike Canasta and Gin Rummy, or other card games you will love thisthis game. The cards are already on the table. What are you waitingfor? Download Royal Buraco - Card Game now and be the great cardchampion! Buraco, also know as Burraco, Biriba, Canasta or Canastra, is atraditional card game in many Latin American countries and Italy.In Buraco: Free Canasta Cards, you can play on your smartphone ortablet whenever and wherever you want, with the rules you prefer:Buraco Aberto, Buraco Fechado or Buraco STBL. Set up matches with 2or 4 players and meld lots of canastas playing against real peoplein multiplayer online or with our bots. Play multiplayer online orpractice against our bots. Chat with other players while you play.3 game modes: Buraco Aberto, Buraco Fechado or Buraco STBL. Set upmatches with 2 or 4 players. Table, decks and cards customization.Ranking and statistics. And for you, a Buraco enthusiast: we inviteyou to join our VIP Club, so you may take part in our ranking andenjoy other exclusive advantages. Try it out, free of charge, forone month, or for one week! Do like millions of other people andplay the best Buraco app for your smartphone or tablet. DownloadBuraco: Free Canasta Cards now and be the canasta master! Canasta Royale is the BEST classic Canasta game created forAndroid. The game offers three levels of difficulty, three uniquegame modes as well as extensive statistics tracking. Unlock bothTeam Play and Hand & Foot modes for unparalleled fun! IncludesFacebook integration! Personalize your game, earn experience withevery game, never lose your statistics! Your statistics are alwaysstored in the cloud and shared between all your devices. Features:• Realistic gameplay and graphics • Intuitive single playergameplay • Three Unique game modes: Regular, Team Play and Hand& Foot! • Three difficulty options! • Extensive Statistics,including games and hands breakdown. • Facebook integration -personalize your game and save your progress. • Unique powerup! Adda extra Joker to your hand to make that final canasta and win thegame! • Four unique themes, allowing you to customize your gameplay experience! World's most complete application to play for free the classic andtraditional Online Card Games played around the world. Play cardswith real people from USA and the rest of the world. It's easy andfast! No need to register, click and play. There are more than 10online and offline card games for you to play: • Canasta - ⭐ MostPlayed • Royal Canasta • Poker 5 Card Draw • Poker Texas Hold'emPoker • Crazy 8 • Spades • Hearts • Scala 40 Online • BrazilianTranca (traditional in Brazil) • Cacheta and Pife (traditional inBrazil and Portugal) • Truco and Truco Mineiro • Sueca (traditionalin Portugal) • Italian Canasta (traditional in Italy) • and moreApp Features: • Play for free with your friends or against thecomputer (no internet - offline) • Game rules to learn how to playcards online • Rooms for different levels of card players •Multiplayer or 1 player mode • Daily, weekly, monthly and yearlyrankings • Participate in tournaments and win trophies • Check yourgame statistics Online Card Games is a free application brought toyou by MegaJogos for amateurs and card professionals! Install nowand have fun with your friends on your phone, tablet or computer. Buraco by Playspace is an online multiplayer game where you canchat with your friends while you challenge them or one of the otherthousands of players who make up our community. Create sequences,meld a card, discard, take the cards from the pile, create the bestcanastas, and go all out!Be the best Buraco online player!FEATURESBuraco by Playspace- It’s free to play!- Chat and play with yourfriends.- Become the best Buraco player in the Playspace ranking.-Play special games: in pairs, turbo and private- Compete to be thebest player in our Buraco Ranking.- Get double coins when you winyour games with the "Double or Nothing"- Unlock achievements andprogress through the game getting gifts and coinsRemember, you willneed to be connect to play. Enjoy the best free Buraco online inPlayspace!Visit our blog http://blog.playspace.com/ Thank you, ThePlayspace Team. Straight Gin Rummy is a version of Gin Rummy in which there is noknocking. Both players attempt to get gin, and the player who ginsfirst is the winner. Find fun and competitiveness in the app: •Play with real people or robots • Excellent game graphics andsuperior gameplay • Lounges for all kinds of players Download nowand start this great game! Find thousands of people playing online.IF YOU ARE COMPETITIVE: • Join tournaments and win trophies •Compete in the ranking • Play and bet with virtual coins • Trackyour stats of the games. OR PLAY FOR FUN: • Casual Games online •Training mode with robots • Chat in the game or privately with yourfriends! • Use search filters to find players • Meet people fromaround the world and make friends! Pife GinRummy is a complete appfor amateurs and professionals card players! Download now andenjoy! Cacheta is from Rummy family card games and is very similar to GinRummy. Find fun and competitiveness in the app: • Play with realpeople or robots • Excellent game graphics and superior gameplay •Lounges for all kinds of players Download now and start this greatgame! Find thousands of people playing online. IF YOU ARECOMPETITIVE: • Join tournaments and win trophies • Compete in theranking • Track your stats of the games. OR PLAY FOR FUN: • CasualGames online • Training mode with robots • Chat in the game orprivately with your friends! • Use search filters to find players •Meet people from around the world and make friends! CachetaGinRummy is a complete app for amateurs and professionals cardplayers! Download now and enjoy! Tranca is a very popular card game in Brazil, originated fromBuraco. It is also known as Canastra Argentina, Canastra Chilenaand Canastra Uruguaia. The difference from other card games is thatTranca is based on 3 cards and how you make sets of three cards!You must use them strategically to get more points or to beat youropponent. Play Tranca with a group of 2 or 4 players against ourbots or play online with other people. If you like to play Buracoor other card games, you are going to love playing Tranca Jogatina.Features: - Practice by yourself against bots or play online withothers - Chat with other players online and make new friends -Cards, decks and tables can be customised - Tables with 2 or 4players - Invite your friends - Train your memory and concentrationwith a fun hobby! Get ready to make tons of set of three cards andcanastas. Download Tranca Jogatina, one of Jogatina's amazinggames!